Please refer to our stock # 3506 when inquiring. 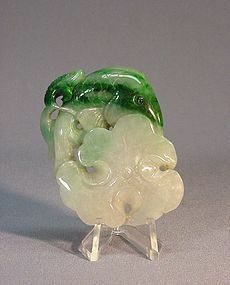 This jade (jadeite) pendant is 2 3/8” long, 1 3/4” wide and 5/16” thick. It is an early 20th century product. It is carved on both sides as a carp with lotus leaf and some small unknown flowers. It was designed and carved in an ingenious way, using the green part of the stone as the carp and the white translucent part as the lotus leaf. It is in great condition.